We’d love your help. Let us know what’s wrong with this preview of The Girl Who Saved Ghosts by K.C. Tansley. After a summer spent in a haunted castle—a summer in which she traveled through time to solve a murder mystery—Kat is looking forward to a totally normal senior year at McTernan Academy. Then the ghost of a little girl appears and begs Kat for help, and more unquiet apparitions follow. All of them are te She tried to ignore them. Now she might risk everything to save them. Outlander series meets The Haunting of Sunshine Girl series. 2017 Moonbeam Children's Book Awards Winner for YA Mystery/Horror. To ask other readers questions about The Girl Who Saved Ghosts, please sign up. Where to start. Oh, I know! K.C. Tansley, puh-lease let me read book 3 ASAP! Without sounding too desperate, I'm The Girl Who Desperately Needs to Read Book 3! Right. So now that I've gotten that bit out of the way, let me tell you about book 2. Disclaimer: As some of you already know, romance and I both pretend the other doesn't exist and we're happy that way, so for me to be wanting to read more about this couple is either a sign we've entered The Twilight Zone or it's an awesome book. Book 2 also introduces us to Kat's two aunts on her unknown father's side, Vivian and Jacqueline, who certainly got their fair share of the personality gene. Vivian is the lovely, caring, encouraging aunt and Jacqueline is, well, quite snippy (but with good reason) and does have a beating heart beneath her grimaces. We spend a fair amount of time at Dumbarton, safe haven for the Langley family. Vivian and Jacqueline are the guardians of Dumbarton and as such cannot leave, although seriously, why would they want to?! Dumbarton is such an amazing place and has such yummy breakfasts that I don't know why you'd ever leave. We're talking "a plate of bacon, sausage, scrambled eggs, French toast, and a fruit cup", with coffee and orange juice to wash it down. If you're still tempted to leave allow me to invite you on a tour of the super secret underground heart of the house that has some pretty cool features including a library of spells. And if you're still not convinced, Dumbarton is the only place in the world where you are completely safe from all of the nasties, including the Dark One, who's trying to destroy you. What? You're staying? Awesome choice! While at Dumbarton we get some of the goss on Maximillian, Kat's absent father, and his sister, Shannon. We also go on a trip back in time to early nineteenth century Vienna where we catch up with more of the ancestors. I loved the new old alive people in the past but ghosts in the present characters in Vienna. The danger ramps up for Kat and Evan in this book, and Kat is more hopeful of the possibility of finally meeting her elusive father. While we haven't been given that much information about the Dark One yet, we did get to know a 'villain' in greater depth and I loved this person. You've gotta love a good villain and I especially like ones that are relatable, the ones where you can put yourself in their shoes and see how it would've been possible for you to make the same choices they did. That's one standout for me in books 1 and 2 of this series. The characters are substantial, not just your leads, but pretty much everyone. You learn their history, what makes them tick, why they made certain life changing decisions. Each of the four families have rich histories that all contribute to their combined mythology. Each step of the way I was piecing more of the overall puzzle together and I was given enough information to chew on so while I know there's more to come, I don't feel short changed by what I learned in this book. I know that when this series comes to an end (hopefully after many more instalments) that I'm going to need to reread them. I'm already anticipating revisiting The Girl Who Ignored Ghosts to read it in the context of what I now know after finishing this book. I can only imagine that anticipation growing stronger as the series marches on. This book has taken me practically forever to finish (15 days) but it wasn't for lack of enjoyment, obviously. I was so interested in learning more about the history of the four families and how everything was going to play out that I didn't want to miss a thing. Each time I didn't have prime reading conditions I'd reluctantly put this book aside and move on to something else until the stars aligned and I knew I'd get the most out of the experience. These are the kind of books that I come to the end of, sigh and say to whoever will listen, "That was so much fun!" If you enjoy magic, time travel, ghosts, family legacies, loyalty to the death, friendships, the threat of the Big Bad lurking, or breakfast, then I highly recommend this series. I'd prefer you to start with book 1 so you know who's who in the ghostie zoo, but if you don't mind jumping in at the deep end and look forward to hearing me very politely telling you that I told you so, then start with book 2. I received a copy of this book from NetGalley (thank you so much to NetGalley and Beckett Publishing Group for the opportunity) in exchange for honest feedback. 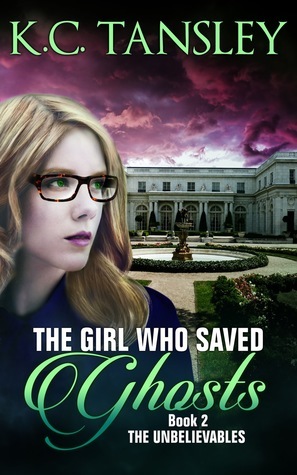 The Girl Who Saved Ghosts was a great follow-on read, the main character Kat is back and with more mysteries to solve. When the bloodstained ghost of a young girl visits her, this brings her back into contact with relatives from her past that she has never met including the father who left her seventeen years ago. Arriving in Dumbarton, Kat and Evan must work together against the dangers of the "Dark One" and time-travel back in Vienna in 1831 to rescue a dagger which went missing that year. Their actions, spells and words could alter their lives forever. What I really love about this series is how visual it is, I found it very easy to immerse myself within the story. The time-travel aspect has kept my interest as well as the developing relationship between Kat and Evan. Personally, there was a tear in my eye when Kat sees her family for the first time, the ending did feel a little rushed again as in the first book (The Girl Who Ignored Ghosts) hence the 4.5 stars. The ancestral connect between all of the characters and their interesting histories also bring a sense of atmosphere into the series. This is a series that you need to read in chronological order, I'm super excited for book 3 when it is released (I don't know when that will be) but out of all of the time-travel novels I've ever read, The Girl Who Saved Ghosts is most definitely one of the better ones! 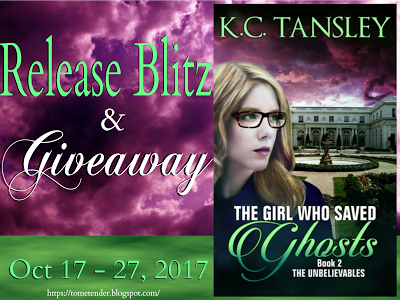 Celebrate the release of THE GIRL WHO SAVED GHOSTS with K.C. Tansley! Enter her giveaway to win a SIGNED copy and fabulous Swag! International - Ends Oct 27 - Click on Banner to Enter! Kat has discovered she cannot ignore the ghosts that haunt her and now she will risk her own life to help right a murder that history got all wrong. Her own history will finally be unveiled as she learns more of the family and the father she never knew. What she didn’t count on was learning of the Dark One, a terrif Celebrate the release of THE GIRL WHO SAVED GHOSTS with K.C. Tansley! Enter her giveaway to win a SIGNED copy and fabulous Swag! The Girl Who Saved Ghosts by K C Tansley is Book II of The Unbelievables, so this will be a short but ‘you will want to read this book’ review. She had put a target on her back from the Dark One, after solving the Radcliffe mystery. Back at school, and the ghosts are relentless, wanting her help. Kat is headstrong, protective, sometimes reckless. She puts her life on the line. She is the peacemaker between the four families, the Radcliffes the Kingsleys, the Mallorys and her own family, the Langle The Girl Who Saved Ghosts by K C Tansley is Book II of The Unbelievables, so this will be a short but ‘you will want to read this book’ review. Kat is headstrong, protective, sometimes reckless. She puts her life on the line. She is the peacemaker between the four families, the Radcliffes the Kingsleys, the Mallorys and her own family, the Langleys. She had only known her mother, so when she was given the chance to meet the rest of the family, she jumped on it and it’s off to Dumbarton. The ring had chosen her. She could not ignore it, or turn her back on her legacy. It is wonderful to have a best friend like Morgan, steadfast and open to the unknown. The danger is mounting and time is short.She must travel to the past again and change what has already been written. I love the combination of genres, the mix of the four young ones who will change their history. To me, the stories hint of Charmed, Supernatural, The Ghost Whisperer…Now, there is only one amulet left to find, so I guess that means another adventure. I’m all in. I voluntarily reviewed a free copy of The Girl Who Ignored Ghosts by K C Tansley. I found this book far more engaging and interesting to read than the first in the series. Again the writing structure was fairly simple but somehow the plot developed quickly and aroused my interest in Kat and Evan and their family legacies. Consequently I began to read more quickly in order to see whether their plans would be successful in strengthening their bond and increase their powers to Thanks to netgalley and the publisher for allowing me to read this ARC in exchange for an honest review. I found this book far more engaging and interesting to read than the first in the series. Again the writing structure was fairly simple but somehow the plot developed quickly and aroused my interest in Kat and Evan and their family legacies. Consequently I began to read more quickly in order to see whether their plans would be successful in strengthening their bond and increase their powers to combat the evil forces trying to destroy the four connected families. Even better then the first book! You can really tell how the author's writing has developed. The writing is a lot more polished. Can't wait to see what's in store for Kat & Evan in book 3! I remember really enjoying the sequel to this book, so I was very excited to read this book! And I was not disappointed! Overall, I very much enjoyed it! The thing I really loved about the first book was the time travel aspect, and I am happy to report that we get that again in this one! Yay! We are going back in to retrieve more family heirlooms and maybe help out some ghosties and clear up another murder mystery. I am all for that! I just really love going back in time, which is saying something because I don't really like historical-type books, which this definitely has a hint of. I also started reading Clockwork Prince earlier this week, which also takes place in the 1800, so yeah, I've been really enjoying reading about this time period. But I'm definitely not gonna go off and start reading historical fiction any day in the near future. Lol. But I did enjoy this and the supernatural touch it had to it. I guess that's the combo I really like: a little bit of historicalness with a whole of supernatural stuff going on! Look, I understand why she did it—it kept her safe all those years from evil entities. But still. It was honestly a ridiculous concept. I am so glad that in this book she is embracing her abilities, now that she is learning more about them. She is even helping out these ghosts with their unfinished business... you could say she is saving these ghosts. Hehe. I also loved seeing Kat develop her powers because she can do so much more than see ghosts! Her abilities are very witch-like, but apparently she is a priestess in this world. Either way, I like that and really enjoyed the magical aspect to it! I also liked the more in depth explanation of the relationship between all four families. It's a really interesting relationship they have. I am very much interested to learn more and what the deal with the Mallorys is. I really like Kat and absolutely ADORE Evan! I totally didn't remember that Kat and Evan didn't end up together in the last book! WHYYY?! I love them together! But then I re-learned (because I totally forgot) that Kat is only a couple months away of turning 18, so she is still underage, while Evan is 20 years old. And Evan being the amazing, decent human being that he is (and Kat too), has not initiated anything... romantically anyway. But the sexual tension is real and I live for it! I am looking forward to the day when they get together! But there were a couple of off things in this book for me, unfortunately. First of all, you may have noticed me not remembering a couple of things about the previous book. I read The Girl Who Ignored Ghosts almost exactly TWO years ago, so you can see why I was struggling with recalling certain things about the book. While there was a little bit of a recap of what happened in the previous book, I definitely could've done with more details. Like Seth and Joshua—were they in the last book? Were they important? I mean, I think so, but I don't really remember. Gosh, maybe my memory is just going, going, gone! Lol. Another thing was that the ending seem to drag out forever. I almost feel like the book should have ended soon after they came back from their, ahem, trip. Granted, I don't know what the next book will be like (because I assume there will be a sequel, right? Right?!) so maybe all that happened in the ending wouldn't fit with the beginning of the next book? I don't know. But I definitely struggled through that. However, all that did not deter me from my overall enjoyment of this action-packed book! Ghosts and time travel and magical powers... yes please! I am very much looking forward to the future (past?) time travel adventures Kat will have and learning more about the families and this crazy, fun world! Would I recommend this series? In one of those happenstances you can't predict (either that or there's a wave I'm not seeing) I've read several girl-who-helps-ghosts stories lately. After the high octane adult ones, this young adult offering seemed slower paced and less intense, but that might be a function of its being aimed at the younger reader. This is the second in the series, but I figured out pretty fast what was going on, partly because some tropes are familiar after decades of reading. There are ghosts and time travel In one of those happenstances you can't predict (either that or there's a wave I'm not seeing) I've read several girl-who-helps-ghosts stories lately. After the high octane adult ones, this young adult offering seemed slower paced and less intense, but that might be a function of its being aimed at the younger reader. There are ghosts and time travel, magic rings and amulets, inherited powers, and even body swaps galore, and a suitably lurking and threatening Big Bad as Kat and her sweet heartthrob Evan try to find justice for ghosts and keep themselves from being swept into extinction by evil. When I was a junior high teacher, this would have been an instant buy for my classroom shelves. The Girl Who Saved Ghosts is the second book in The Unbelievables series, and it was as enjoyable as the first book. Much like the First book, The Girl Who Ignored Ghosts, my feelings are somewhat mixed. Certain elements of the story I really enjoyed whereas other elements didn’t quite live up to what I had been anticipating. As with the first book, it’s more of a three-point-five-star read. The Girl Who Saved Ghosts builds heavily upon the events of the first book, meaning you need to read the f The Girl Who Saved Ghosts is the second book in The Unbelievables series, and it was as enjoyable as the first book. Much like the First book, The Girl Who Ignored Ghosts, my feelings are somewhat mixed. Certain elements of the story I really enjoyed whereas other elements didn’t quite live up to what I had been anticipating. As with the first book, it’s more of a three-point-five-star read. The Girl Who Saved Ghosts builds heavily upon the events of the first book, meaning you need to read the first book to understand what happens in this one. The characters of book one reappear, with the events building upon what took place in the first book. In this one, we get to find out a lot more about the world than we did in the first book. Details of history and the families grow, giving us a much better understanding of what we are facing. There are still plenty of questions, many unknowns, but the image is much more solid in this one. In addition to the storyline moving forward, the supernatural elements also become much clearer in this book. We had a pretty solid understanding from the first book, but there were many things we were still unsure about. This book addresses many of these issues, and helps to show us more of the world through taking us beyond the aspects introduced in the first book. Whilst the general supernatural elements were explained quite well, I’m a bit disappointed that the big evil wasn’t given the same amount of development. We got to find out bits and pieces about the darker side of the world, but I’d been hoping for a little bit more in terms of finding out about the big evil. I’m hoping such with come in the next book, though. As with the first book, though, whilst I was interested in the events it didn’t quite pack the punch I’d been anticipating. I think a part of this may reflect my recent reads. I’ve read a lot of adult suspense books recently, a lot of books with high intensity action, and in comparison this felt much softer. There were moments of action, but I never really felt my heart pumping. I enjoyed what happened, but I wanted to be impacted more. A big shout out to NetGalley and Beckett Publishing for the ARC for my honest review. I have not read the first book-I actually didn't notice that it was the 2nd in a series. I have now obtained the first book but I am reading them out of order. It actually reads rather well as a stand alone-I didn't feel like I was missing that much by starting with the second. It certainly didn't detract from the book. I enjoyed this book as I never knew what was going to happen next. No spoilers as it appears A big shout out to NetGalley and Beckett Publishing for the ARC for my honest review. What a page turner, I couldn't put it down once I started reading. This is the second in The Unbelievables series but can be read as a stand alone. The Girl Who Saved Ghosts is a YA paranormal, time travel, mystery with plenty of ghosts. I really enjoyed this book and now I just have to read the first one, The Girl Who Ignored Ghosts. Kat spent the summer in a haunted castle where she traveled through time and helped solved a murder mystery. She didn’t do it alone, Evan was with her and she couldn’t have done it without him. Which wasn’t a surprise once she realized the history behind their families and the ties that bind them together. Now Kat is back at McTernan Academy for her senior year. After spending most of her life making sure that ghosts couldn’t contact her, it seems like the floodgates are open. She is being asked Kat spent the summer in a haunted castle where she traveled through time and helped solved a murder mystery. She didn’t do it alone, Evan was with her and she couldn’t have done it without him. Which wasn’t a surprise once she realized the history behind their families and the ties that bind them together. Now Kat is back at McTernan Academy for her senior year. After spending most of her life making sure that ghosts couldn’t contact her, it seems like the floodgates are open. She is being asked to solve problems for many who have passed before. Kat’s been doing her best, but helping ghosts is exhausting and she’s worried someone at school will walk in on one of her encounters. When the ghost of a young girl begs Kat for help, she knows that she has no choice but to become involved. Unfortunately, she learns that the Dark One, an evil force, wants Kat dead. Will she even survive her senior year? Kat knows she needs help and the only people can help her are two great aunts she has never met. But, they live in the ancestral home and that is the only place she can train and learn about her abilities. What she learns may help her to save the ghost of the young girl, but her own life will be put in danger. Is it worth the risk? Is there a choice? Find out what adventures await Kat and Evan and what they may sacrifice along the way. I was lucky enough to read an ARC of The Girl Who Saved Ghosts, book 2 in the Unbelievables series. I enjoyed it so much that I decided to read it again now that I have a print copy. What a fun book! It was fascinating finding out about Kat’s ancestors and how different families are connected. I would love to see her ring, which helps her to contact ghosts. The magical artifacts in the story all sound interesting! I like the way the characters continued to develop in this story and now that Kat knows more about her father and other relatives she has a depth to her that makes her seem wise beyond her years. The story brings the supernatural together with reality in a way that makes the magic that much more believable. A perfect mixture! Things really get tense when lives are on the line and I couldn’t turn the pages fast enough. I recommend this book to anyone who enjoys a good mystery. I am already looking forward to the next book in the series. What will happen next? Kat gets to meet her family in this book and learns a lot about the history of all four families that are bound together. Kat and Evan travel back in time to find the missing dagger that Evan will need to protect him. He almost dies saving Kat before they arrived to her family's home, so getting this dagger is a must. This time Kat wants to see if she can do more to change the past and protect Ellie and Percy who died a long time ago. Kat gets hurt in the process. While healing, Kat and Evan spe Kat gets to meet her family in this book and learns a lot about the history of all four families that are bound together. Kat and Evan travel back in time to find the missing dagger that Evan will need to protect him. He almost dies saving Kat before they arrived to her family's home, so getting this dagger is a must. This time Kat wants to see if she can do more to change the past and protect Ellie and Percy who died a long time ago. Kat gets hurt in the process. While healing, Kat and Evan spend more time at the family home. Kat has to learn spells and Evan needs to learn protection. We see a bit more of Toria and find out what happens to her. And the Dark One is out there waiting to destroy them all. I would have loved more of Morgan in this one. She was one of my favorite characters from book one and I'm hoping she'll be a bigger part of the next one. Overall, I loved this book and gave it 4 1/2 stars. The time travel part wasn't as good as book one for me, but there was plenty of magic and history to make up for it. I'm loving this series and can't wait for book three. “The Girl Who Saved Ghosts” is the second book in the imaginative “Unbelievables” series that combines mystery, time travel, and ghosts with a hint of romance. It begins when Kat Preston Langley who’s beginning her senior year at McTernan Academy is visited by the ghost of a young girl who insists she did not kill the Kingsley heir and needs her help to prove it. With the curse of the Langley Legacy and the determination of the Dark One to kill her, Kat is reluctant at first to help Ella Harding “The Girl Who Saved Ghosts” is the second book in the imaginative “Unbelievables” series that combines mystery, time travel, and ghosts with a hint of romance. It begins when Kat Preston Langley who’s beginning her senior year at McTernan Academy is visited by the ghost of a young girl who insists she did not kill the Kingsley heir and needs her help to prove it. With the curse of the Langley Legacy and the determination of the Dark One to kill her, Kat is reluctant at first to help Ella Harding but when urged to go to the Langley ancestral home to train and to help Evan recover the Kingsley dagger she gets caught up in an adventure that has her risking everything to help solve the murder mystery. In a fast-paced thriller Kat and Evan travel to Dumbarton, the Langley ancestral home where she reunites with Toria, a loyal family ghost and hopes to meet her father for the first time while training with her eccentric aunts Vivian and Jacqueline only to be swept away with her friend Evan to nineteenth century Vienna where they must retrieve a powerful dagger and uncover clues to a murder that left an eleven-year-old girl covered in blood and holding the blade that killed the Kingsley heir. 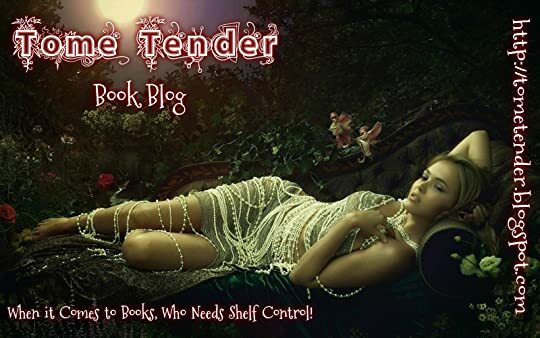 Intensity and suspense quickly build in a plot filled with twists as Kat and Evan not only tamper with history while staying out of the clutches of the darkness that pursues them but on their return, must make a decision whether or not to tempt fate and help a pair of ghostly lovers. Well-written and complex, the story is a page-turner from beginning to the cliff-hanger at the end. Bringing excitement, emotion, and tension to the story are characters like Kat Preston Langley who’s haunted by the abandonment of her father and fear his family doesn’t want anything to do with her. She’s smart, capable, independent but cautious especially when she gets a video call from her aunts. Trustworthy and protective Evan Kingsley who keeps his feelings for Kat locked away because of their age difference doesn’t hesitate to follow her to Dumbarton and then back in time. Kat has discovered that her father is a Langley and he has passed on the “mantle” of keeping the Radcliffe heir safe, even from the supernatural. Kat is visited by a young ghost named Ellie who was accused of killing Percy back in the 18th century, so again Kat has to investigate these deaths and try to change the past. But first she needs to go into training and is sent to stay with her Aunts the Langley sisters who are going to help her discover more of her powers before the Dark One finally finds her and kills her or anyone else she cares about. Kat needs to get away from all the ghosts who are trying to get their reckoning as they seem to know something that she doesn’t. This was a great story and had everything that a YA series could want with time travel, magic, mystery and the supernatural. Can’t wait to read the next book in this series. The Girl Who Saved Ghosts by K.C. Tansley is the second book in The Unbelievables series. Kat Preston Langley is returning for her senior year at McTernan Academy with her best friend, Morgan Sanchez. The ghosts that wants their reckoning have followed her back to school. One young ghost named Ellie is covered in blood and asks Kat for her help. Kat is not sure how she can save Ellie and something more pressing captures her attention. Kat discovers that a sinister force called the Dark One is ou The Girl Who Saved Ghosts by K.C. Tansley is the second book in The Unbelievables series. Kat Preston Langley is returning for her senior year at McTernan Academy with her best friend, Morgan Sanchez. The ghosts that wants their reckoning have followed her back to school. One young ghost named Ellie is covered in blood and asks Kat for her help. Kat is not sure how she can save Ellie and something more pressing captures her attention. Kat discovers that a sinister force called the Dark One is out to kill her. She needs training and the only people who can provide it are her two greats aunts (Jacqueline and Vivian) at Dumbarton. Kat along with Evan Kingsley travel to Dumbarton and meet with trouble as soon as they step off the train. The Dark One is testing their strength. To help Kat in the present, Evan and Kat need to travel back to 1831 Vienna to retrieve the Kingsley dagger. It is supposed to be a quick mission, but then Kat has a chance to help Ellie. Will Kat and Evan make it back to the present safely (let’s settle for alive) or will they meet their end in old Vienna? It is a second book in The Unbelievables series, where our young Kat uses her powers to help ghosts instead of ignoring them. As in a first book she gets in to a much trouble and has to go to the past to fix some things. That is my brief synopsis of this book. Now. lets see what I actually thought about this book. Well, I tried to like it, I really did, but the second book just fell flat on it's face in my opinion. I remember reading first book and really enjoying it, but with this one I struggled to get in to. It took me ages to finish it and even to read it, I had to force myself to pick it up. This story was unbelievable boring and it seems like nothing happens until around 70% of the book. And then when things starts to escalate the ending is rushed and just plain anticlimactic. Also, there is no much to say about the characters. This time Kat seemed to be very annoying and whiny. There where plenty of times where I had to roll my eyes, when she did something stupid. After reading (and loving) the first book in the series, I immediately requested to read this one. And thankfully for me, the publisher accepted my request! This was just as much fun to read as the first book. Once again Kat is sent back in time to retrieve another family heirloom. But that's not the only goal. She also sets out to save her ancestors from the past and do everything in her power to put confusions and mistrusts to rest. I love the addition of characters for this story. I love Jacqueline and Vivian. I loved their personalities, Such unique contrasts from each other. I loved the mystery. Once again, I was so intrigued with the mystery and I couldn't put the book down! I read this every free moment that I got. I highly recommend this series to anyone and everyone! It's such a fun and great read! I find myself really enjoying this book, and I wish book 3 were available immediately, because I just want to continue the story. I much preferred this book to book 1, and I really like the developing relationship between Kat and Evan. The unfortunate side effect of this book lasting three weeks with Kat in Dumbarton, is that the side characters like Seth and Morgan aren’t present, and it just reinforces this lack of Thank you to the publishers for providing an ARC of this book through NetGalley. I much preferred this book to book 1, and I really like the developing relationship between Kat and Evan. The unfortunate side effect of this book lasting three weeks with Kat in Dumbarton, is that the side characters like Seth and Morgan aren’t present, and it just reinforces this lack of interest that I have for them. I love the aspect of Kat (and Evan) going back into the past and trying to change things. I do find that the characters in the past are generally more interesting that the ones in the present and I did find myself really feeling for Ellie while reading. I was pleasantly surprised by this book. For me, it had elements of Harry-Potter-esque writing, and also reminded me of The Twilight Saga. Kat and her college friends are strong characters, and I was really swept up by the writing style. KC Tansley is a new author for me, and I felt like I really "got into" the story very quickly and my intest didn't wane. I do want to read the first book to get more background as to how the story started from the beginning of the series. Even though I started w I was pleasantly surprised by this book. For me, it had elements of Harry-Potter-esque writing, and also reminded me of The Twilight Saga. Kat and her college friends are strong characters, and I was really swept up by the writing style. KC Tansley is a new author for me, and I felt like I really "got into" the story very quickly and my intest didn't wane. I do want to read the first book to get more background as to how the story started from the beginning of the series. Even though I started with the 2nd book, I felt like I knew the characters and surroundings well. There are ghosts, mysteries and challenges which I think will appeal to young adults and older adults alike. As soon as I turned the last page for The Girl Who Ignored Ghosts, the first book of this series, I immediately reached for this one. The Girl Who Saved Ghosts expands upon the foundation laid in the first book, exploring the mysteries of Kat's magical heritage and her family history as Kat and Evan embark upon another time travel adventure.. This one was more character-based, fleshing out and developing the characters. After a tumultuous summer spent investigating a century old murder mystery an As soon as I turned the last page for The Girl Who Ignored Ghosts, the first book of this series, I immediately reached for this one. The Girl Who Saved Ghosts expands upon the foundation laid in the first book, exploring the mysteries of Kat's magical heritage and her family history as Kat and Evan embark upon another time travel adventure.. This one was more character-based, fleshing out and developing the characters. After a tumultuous summer spent investigating a century old murder mystery and discovering her paranormal powers, Kat is looking forward to returning to her predictable, mundane school life. Then the bloodied ghost of a little girl appears, begging Kat to help prove she didn't commit a murder. Additionally, Kat is warned by other ghosts that the Dark One is looking for her. Kat travels to her ancestral home in the hopes of learning more about her gifts and to seek help. Once she and Evan arrive, they discover that the only way to have a future is to again travel to the past. I have a weakness for time travel adventures and I love Tansley's rather unique spin on the concept, particularly in this novel. It allows the reader to watch history as it unfolds and I enjoyed watching Kat and Evan try to fit all the pieces of the puzzle together. Now that the premise of this series was firmly established in book one, this installment starts to explore the bonds between the families more. I found myself really emotionally invested in the characters from the past. As their story unfolded, I couldn't help but hope that Kat would find a way to change the past. While Morgan, Kat's best friend, was missing from this novel, we did get to meet some other wonderful characters. Kat's aunts are a study in contrasts and I liked watching her interact with them. I'm still not sure how I feel about Kat and Evan's romantic relationship but I loved how their partnership evolved in this book. It will be interesting to see how their hereditary roles change their relationship in the future. I wasn't a huge fan of the amorphous the Dark One concept but the main villain in this story made up for it. She was wonderfully dark, I love it when the reader can somewhat empathize with the villain of the story. The Unbelievables is a series that's worth picking up if you're looking for a fun paranormal read full of family curses, magic, and historical fiction. The Girl Who Saved Ghosts was a strong sequel and I'm intrigued to see where Tansley takes the story next. I gave this book 4 stars. This sequel was way better than the first book to say the least. I was 100% invested by the end that I really just want to sit down and binge the rest of the series that has yet to be written. Kat is what I would call a perfect character. She is the perfect amount of flawed, relatable, and compassionate. She’s a character that maybe I don’t love with all my heart, but I can’t think of a single reason to dislike her. She’s a solid character that I don’t mind reading about at all. Evan has done such a one eighty from when we first met him. He went from the man who was making Kat miserable for no apparent reason to making sure that everything was always going okay for her and that protecting her when she needed it the most. What I find most grounding about this series in general is the fact that they don’t always win. In most YA novels the protagonist somehow manage to always come out on top, nothing bad ever really sticks to them. In this series, Kat can’t fix everything with the snap of her fingers. She wants so badly to help them and she does to a point, but she can’t fix things 100% and sometimes those small bits and pieces that remained broken are really heartbreaking. If you’ve read the first book already you can probably sense the slow burning romance coming on. It hasn’t happened yet but the sense is getting a lot stronger, there are many hints and I’m curious to see how it’s going to happen. I’m happy to report that we also finally get to know what their ages are! I was so confused about how old the characters were in the first book and I’ve finally figured it out. The group of friends are in this special boarding school, their seniors so 17 or 18 years old; Evan is in fact 20 years old doing that teacher assistant thing. I don’t know if it’s for school or if it’s an internship of some sort, it becomes more clear while still remaining pretty vague. As she does in her first book of the series, author K.C. Tansley deftly weaves real-world concerns of a high school senior into her time-travel murder mystery. However, in Book 2, the stakes are even higher, our understanding of Kat deepens, and answers to questions about the Langley legacy posed in Book 1 are revealed by the novel’s end. Kat’s quest (you’ll have to read to find out exactly what that is—no spoilers in this review!) deepens the theme of personal sacrifice and how everything gaine As she does in her first book of the series, author K.C. Tansley deftly weaves real-world concerns of a high school senior into her time-travel murder mystery. However, in Book 2, the stakes are even higher, our understanding of Kat deepens, and answers to questions about the Langley legacy posed in Book 1 are revealed by the novel’s end. Kat’s quest (you’ll have to read to find out exactly what that is—no spoilers in this review!) deepens the theme of personal sacrifice and how everything gained must come at a cost. This gives Book 2 wonderful layers of tone, a moodiness that accompanies the action, into the past and nineteenth-century Vienna. Kat’s development as a character is rich both in terms of how she grows into understanding her magical powers and her sense of her identity as a young woman. With the magical world of the four families established in Book 1, Book 2 focuses more on Kat and her immediate relationships—to her family, to her family home, Dumbarton, and to the bonds of the Langley family legacy. Although the pace in more measured in Book 2, the unfolding of Kat’s identity and the revelations about the complex relationship between the four families’ magical entanglements/commitments to each other are immensely satisfying. Discovering the answers to questions posed in Book 1 makes The Girl Who Saved Ghosts a real page-turner (I may have stayed up way too late to finish reading in one sitting!). However, the Epilogue feels much more like a pause than an end. Hopefully, the wait for Book 3 won’t be long! (Note: I received an ARC in exchange for an honest review). Kat, I felt, was the most changed, since her decision to allow ghosts back into her life is literally draining the life from her, b K.C. Tansley’s Unbelievables series captured my imagination when I reviewed the first book in the series two years ago. Now, with the second book, The Girl who Saved Ghosts, I feel like I’m revisiting old friends. They’ve grown and changed a bit since our last meeting, but Kat and Evan are still brave, kind, and a little bit reckless, the way we all wish we could be. I was given an advanced copy of this book by Xpresso Book Tours in exchange for an honest review. Wow, wow, wow!! This was a fantastic sequel to The Girl Who Ignored Ghosts! I was happy to have both books so that I could read them back to back because I absolutely loved the world that Ms. Tansley created in the first novel. The Girl Who Saved Ghosts is an excellent addition to The Unbelievables series, and makes me want the third book right away! With richly described characters and a more in-depth look at the spirit world, this novel has everything you could want in a sequel! One of the things I loved about the first novel was the rich storytelling and how intriguing Ms. Tansley made the spirit world. I didn't think it was possible, but she made me love the world she created even more! She delves further into the spirit world as well as the curses and legacies surrounding the 4 families. I love how things are tying together and it makes me even more excited for the third book. While I didn't love the time travel aspect as much as I did in the last book, I still enjoyed it quite a bit. I think the reason though was because I was so interested in what was going on in the present with the characters! Kat and Evan learn more about their respective family and Kat explores the extent of her "powers." And when an unexpected character shows up, I really wanted to see the interaction between him and Kat. One of the things that I had a little bit of a problem with in the first book was the lack of character development for the main characters. However, this was completely resolved in this book! Kat is fleshed out a bit more and we start understanding her perspective on things. She is still very relatable, but I connected with her more this time. I do want to learn more about Evan though. He's still a bit mysterious, but his true colors are starting to come through, and let's just say I'm now shipping Kat and Evan even harder than I was in the first book (who knew that would be possible??). I love how protective Evan is of Kat while still giving her the space to embrace her "powers" and be her own person. While I do wish that we would have seen more of Morgan and some of the other characters, this book really was about Kat and Evan learning more about their families and histories. But hopefully we see more of Morgan in the next book because I adore her character. This is such a fantastic series and has all the right elements of a perfect paranormal read. Ms. Tansley's writing is even better than in the first novel, and the story is addicting from page 1. I highly recommend checking out this book (especially since it's almost Halloween and who doesn't love a good ghost story in October!). The story begins by Kat being bombarded by ghosts looking for their reckonings so they can move on and not stay tied to this world. They all seem to be terrified of the Dark One who has made issued a death threat against Kat. She receives help from an unlikely source, her dad’s family, a man whom she has never met. She must travel back in time, with her friend Evan, to find a dagger if she has any hope of defeating the Dark One. This book reminds me of many of my favourite magical TV shows and book The story begins by Kat being bombarded by ghosts looking for their reckonings so they can move on and not stay tied to this world. They all seem to be terrified of the Dark One who has made issued a death threat against Kat. This book reminds me of many of my favourite magical TV shows and books like Charmed, Harry Potter, the Worst Witch and even a little hint of Sabrina the Teenage Witch. Although I would recommend before you read this book to read the first, The Girl Who Ignored The Ghosts. I didn’t and I feel like I missed a few things as it kept referring to the other book. There was a lot to take in, magical rings, ghosts and time travel to name a few. There is so much I couldn’t fit it in this review! I have to love Kat. She wears glasses and is on the curvy side. She’s also brave, strong and tries to do the right thing, even if it almost costs her her life. There’s a bit of chemistry between her and Evan, I can feel a bit of a romance is in the air with those two. I ended up really enjoying the book even the whole time travel aspect which is a difficult feat to pull off without seeming a little cheesy or forced. I feel though the story lost a bit of steam near the end. I understand it was rounding off the story and building up to the next but I just kept expecting some action or something which never happened. Kat has been in a struggle since they came home from Castle Creighton. She's been constantly hounded by ghosts who are lining up for the chance to get their "reckoning", or their final piece before they can move on. They're lining up waiting to talk to her which is sapping her of all her strength. It leaves her helpless and weakened which is not good because of what fate has in store for them. There is a great evil in the game now that you could even call the ultimate evil. It's an ancient evil t Kat has been in a struggle since they came home from Castle Creighton. She's been constantly hounded by ghosts who are lining up for the chance to get their "reckoning", or their final piece before they can move on. They're lining up waiting to talk to her which is sapping her of all her strength. It leaves her helpless and weakened which is not good because of what fate has in store for them. There is a great evil in the game now that you could even call the ultimate evil. It's an ancient evil that has been around for centuries. This evil is now after Kat. She gets to adventure to the Langley home and learns more about her family lineage and the lore behind all the families. Which is tough for her since she grew up without knowing anything or anyone from this side of her family, including her father. Going to her families ancestral land is really important because it starts Kat and Evan on a clear path for their futures as the current heirs to two of the four families. I loved the family history part of this. Just the idea of it is fantastic and I can't wait to see how the future books in the series continue. Of course, since Kat's powers deal with the past, they go into the past again. Just Kat and Evan again, and this time its to get his families relic. A dagger of badassery... I don't want to spoil too much, but I feel like each family has some amazing mystical properties to them. You start to really touch into that in this book when the two begin their training. I'm dying to know how many books are going to be in the series. The book is written with a good clear path for character development and I am looking forward to seeing them grow. I can say I'm attached to these characters for sure. Not to mention the budding romances and where they are going to go. I was totally like a teenager girl in those two moments that I will not spoil. You'll have to read the book so you can grin like little girl like me. Never one to say no to a road trip, she’s climbed the Great Wall twice, hopped on the Sound of Music tour in Salzburg, and danced the night away in the dunes of Cape Hatteras. She loves K.C Tansley lives with her warrior lapdog, Emerson, and two quirky golden retrievers on a hill somewhere in Connecticut. She tends to believe in the unbelievables—spells, ghosts, time travel—and writes about them.